Look for it within the Skype desktop app within the next few weeks. Not too long ago, translation meant laboriously cutting and pasting a phrase into a text box or linking to a Web page. That's about to change as Microsoft rolls out its real-time “universal translator” Skype users. Within the next few weeks, Skype said Thursday, the company will begin pushing its integrated translation capabilities into the desktop version of the Skype app. (You’ll see a globe icon to the top right if it’s live for you.) At this point, calling it “universal” is a bit of a stretch, as only six languages—English, Spanish, French, German, Italian, and Mandarin Chinese—are supported. But there are an additional 50 “messaging languages” the app will support for text chat, including Estonian, Urdu, and Welsh. 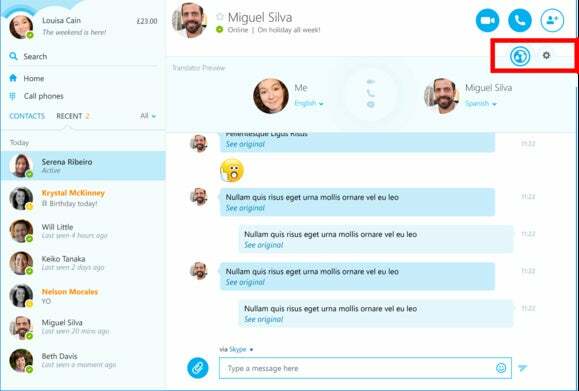 For now, the Skype translation app is still being referred to as a preview, meaning you shouldn’t expect the quality of translation a native speaker or translator would be able to provide. But the app should be able to at least facilitate booking a room with something like Airbnb in another country, for example, and chatting with the owner about the condition of the furniture. And given that Microsoft will be able to use more language samples as it opens up the app, you can expect the quality to continue to improve. One nice perk: Apparently only one of the speakers involved with the conversation will need to use the translation capability; the other will be able to tap into the cloud translation as well, according to Geekwire. Why this matters: The ability to communicate is a fundamental human need, and the language barrier is a real thing. Fortunately for Americans, many other cultures choose to learn English. But that’s not always true. In any event, simply being able to converse with another person and use spoken language and body language to communicate, as Skype’s voice chat does, is pretty magical.